As to the question of collective bargaining rights, 56% said they were on the unions’ side in the debate, while 41% said they sided with Walker. Further, 52% said they oppose Walker’s proposal to cut collective bargaining rights for state unions, compared to 39% who said they support that proposal. Walker has insisted that rolling back collective bargaining rights is a necessary step toward producing a balanced budget. While state unions have already agreed to make concessions on the amount of money they pay toward benefits, Walker has refused to back down on collective bargaining, even as protesters continue to flood the state capitol. Another key detail — the poll shows younger voters being generally more supportive of unions and collective bargaining rights than those in older demographics. That’s a reversal of what is often assumed to be the case — younger voters tilting liberal on social issues, while older voters lean liberal on the labor issues. For example, 63% of respondents aged 18-39 opposed weakening collective bargaining rights, while 46% of respondents in both the 40-64 year-old and 65+ demographics said the same. 18-39 years of age isn’t just the young. What’s so significant about this is the age group that shows the greatest concern against the bill is the one group of people most affected by the Depression…ahem…recession. More than 17% of Americans who want full-time work cannot get it. You’d think this age group would support this bill overwhelmingly, considering that their prospects have been bleak for years. Rather than opining to drag the public workers down to their level, they have decided to support higher wages and benefits for the working man as a whole. At least, that’s what this poll is telling me. Whoever said that the masses couldn’t organize and collectively do what was right for all? Republicans are losing the war of words on this issue, and are unwilling to compromise; another bad idea. We all remember how the health care debate energized the Republican base. It seems as if this debate is energizing not only the Democratic base, but the Independents as well. Why? For starters, there’s that 17% underemployment thing to consider. Independent voters have long been against Free Trade, and many of us view Free Trade legislation as being responsible for the lack of jobs available in America today. Then there is the ever-dwindling wage and benefit scale in America. People aged 18-39 are either entering, or trapped in a job market that consistently attacks their ability to earn a living wage. Simply put, Republicans are coming down on the side of The Man, and that is political suicide in a depression-recession. Furthermore, they are losing the message war in the same way that Democrats badly lost the message war over health care reform. It’s being called the Republican Over-reach. That’s what the mainstream media has named Walker’s bill, and the bills of several other states. But it’s not over-reach, really. This is what Republicans do. They firmly believe that Corporate America has the answers to everything that ails us, and they have hitched their wagon to an idea that wages and benefits negotiated in good faith over the last 50 years are fair game. What kind of message is that sending to people aged 18-39? I think it’s a message of despair for the masses. I think the message is such that Independents are siding with liberals in this battle because we’ve seen the damage that Free Trade has done to our ability to find good jobs and negotiate good wages. On Wednesday, Governor Scott Walker of Wisconsin received a phone call from a man he believed to be David Koch, multi-billionaire energy monopolist. The caller wasn’t Koch, but an imposter. The left side of America went berserk upon listening to soundbites of the phone call, believing they had listened to the devil admit he was the devil. In the end, of course, Walker wasn’t and isn’t the devil. He said pretty much the same things to the man he believed was Koch as he has been saying publicly all along. I wasn’t upset at all by the things he said. Nevertheless, I was upset. It’s not about the soundbites or Walker’s words. What I’m upset about is that a multi-billionaire can simply pick up the phone and reach an American Governor any time he wants to, even if that governor is not his governor. There’s a lesson here for America, and especially for our politicians that won’t be learned because no one is talking about it. How does a rich man supposedly previously unknown to Walker, a man not living in Wisconsin as a resident, pick up his phone, dial Walker’s office, and be connected to the Governor of Wisconsin for a twenty-minute conversation? How does that happen, exactly? Is Governor Walker this easily reached by everyone? That last question was rhetorical; of course Governor Walker isn’t so accessible to his constituents. No politician in this country is. But for some reason, if you have millions upon billions of dollars, and you might just be a large contributor to the “Party”, you’ve got access. You’ve got so much access that you get twenty minutes of a very busy governor’s time. Twenty minutes. Think about that. The access of the wealthy and famous to our leaders is part of what is wrong in this nation, and probably something that our founding fathers would have wished to avoid. Walker, and our other leaders don’t even care about the appearance of class access to leadership, much less the actual thing. This is the height of political arrogance; a belief that as a leader, you can grant special access to the wealthy and famous, access available to no other constituent, and not be accountable for it. 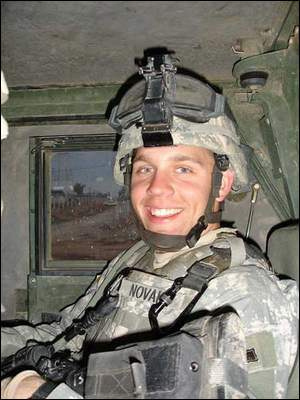 Solemn Memorial Day: In Memory of SPC Shaun A. Novak, and Many, Many Others. Memorial Day in Wisconsin. A marching band playing patriotic tunes, a parade, Veterans of Foreign Wars marching by, politicians in their convertibles because they’re too important to walk, and finally, the cemetery. A solemn service, a speech or two, more patriotic tunes, and finally the crowd disperses, each to his own celebration of Memorial Day. Maybe you go to a nearby lake, or the beach of Lake Michigan. Maybe it’s your own backyard, with friends and family gathered around. Whatever the setting, beer and bratwurst are nearby anywhere you go in Wisconsin, along with that nagging feeling that tomorrow will come too soon, and this three-day weekend will be over. For most, Memorial Day is just that; a three-day weekend, a reason for a trip to the cottage up north, an excuse to cook out, drink beer, and swim in the lake. People pray for good weather, as if God finds weather the most important thing on Memorial Day. What’s missing from this nearly perfect setting? The reason Memorial Day is a Holiday at all, that’s what’s missing. The dead are missing. The grief is missing. The remembrance of those who shed their lives in the ultimate sacrifice for their country. Sure, we can remember them for a minute or two at the cemetery, if you go there. But most don’t. Most have been planning this weekend for a month; right down to the Secret Stadium Sauce for the brats. But what most haven’t planned for is the dead, especially those from their own community. That’s what this day is for. It’s for those men and women whom America forgets in our daily lives. We set aside one day a year to honor the fallen in arms. One of them I do not know came to mind this morning, a young man from Two Rivers, Wisconsin, who, along with four others, was killed by a roadside bomb on August 27, 2006, in Taji, Iraq. His name is Shaun A. Novak, SPC. Here is a link for his memorial page, so that you can know him this day. But for most of us, Memorial Day isn’t even set aside for them. It’s set aside for us; for our leisure, our enjoyment, our vacation. Shaun A. Novak left behind a Father, a Mother, a Brother, a girlfriend, a whole host of friends and family, and he left behind so much more than that. He left behind the shadow of his soul; whether that be a memory of his service, or for those who knew him, a memory of a life well lived. He left behind a name that will be remembered in Two Rivers, Wisconsin for as long as Memorial Days are celebrated. He left behind a circle of friends and acquaintances, each of whom, though they know it not, are still affected by their having known him, every day of their lives. Memorial Day is for those who grieve. It is a day set aside to honor not just those who have passed, but those whose lives have been torn asunder by loss. It is in honor of those wives, husbands, mothers, fathers, lovers, family, close friends, that we celebrate MEMORIAL Day. If you have ever attended a funeral with full military honors, you know the loss I am speaking of. There is no other funeral service like it for grief, anger, loss; an absolute surrender to emotion. No one touches the heart of a community like a fallen soldier, because every one within it knows that this is one death that was given freely, yet no one can willingly accept it in such a sacrificial spirit. Their loss is not common amongst their community. How many families have lost a son in battle in Two Rivers, Wisconsin since we attacked Iraq and Afghanistan? One. The Shaun A. Novak family. That’s it. To understand how rare and uncommon the ultimate sacrifice is, just check your own community, and the communities nearby for the frequency of a soldier’s sacrifice in battle. Memorial Day isn’t a day to remember the hundreds upon thousands of soldiers who have died at arms. It’s a day to remember the one or two from your community who died for your freedom. You see, when we try to celebrate the sacrifice of thousands, something gets lost, and I think that something is so very important. It’s the personalization of that grief, that loss, that causes mothers, wives, and lovers to wail in agony as the sacrifice of their loved one is honored by Taps. It is the knowing that causes grief, honor, and celebration. You cannot know hundreds of thousands of soldiers, but you can know the one or two in your own community. Instead of going to the parade today, one in which my daughter was leading her high school flutes, I stayed at home and looked for Shaun Novak. I knew of him, but I never knew him. He worked at the restaurant just up the road from me, but I can’t say that I recall ever seeing him there. But I found out about him a little bit today. And so I’m going to honor him. In my own, pathetic little way, I’m going to dedicate this day to Shaun, and my best thoughts and hopes I will send out to his family, to his friends, to his lover and to those soldiers he left behind. He deserves so much more, and so do they.